1 disposable E-Z Mix plastic paint ""mixing"" bucket stuffed/treated with several rusty copper pipe joints and elbows of various sizes. 1... a set of old wooden curtain poles I found left out in the street for waste collection. I discovered that they had an interesting acoustic property when struck, and as they were cut to different lengths (to fit different size windows), they all resonated with different pitches. I recorded several different sounds of them coming into contact with each other, collecting quite a varied set of recordings, which I then selected rhythmic loops from, which form the basis of the first half of the piece, along with some unlooped real-time recordings of the wooden poles. 3... empty wine bottles, both hitting against each other, and smashing against concrete, which provided most of the sound for the second half of the piece. 4... a field recording from August 2008 of a public demonstration of a new hi-tech waste recycling system being introduced in Ljubljana, Slovenia. The voice heard at various points is that of a city official explaining the system to the assembled press and public, whilst the mechanical drone at the end of the piece is the recycling system in progress. The title 'Preostanek Odpadkov' can be seen on one of the waste cylinders in the film, and translates as 'all other waste'. Again a fantastic built track from the Groceries. Great recordings and they work really well together. All instruments found or created from things that were either recycled or thrown away. All pitches are played were freely selected by ear without regard to harmonic theory. A basic percussion track was recorded with a Zoom H2, consisting of a simple bass drum figure played on a 5Litre plastic mineral water bottle. This defined the structure of the piece, 3 disconnected rhythmic sections each at slightly faster tempo, the last one leading into a 4th slow section. Recording was then transferred to desktop pc, equiped with Focusrite Saffire Pro interface and running Adobe Audition. All pc recordings made with Sennheiser 421 which was re-used from it's usual task of talking on Skype with Matthias Grob. Two tracks of percussion were added, and panned left-right. Plastic sorbet container by "Pianola", the sorbet having been consumed (Lychee and Apple flavour). A Fretless Kalimba was made from recycled wood, metal from discarded windscreen wipers, recycled nut and bolt and a discarded container for 50 CD-Rs used as a resonator. A number of tracks were recorded. A small shawm was made from discarded drinking straws and used to record the intro and linking passages. The echo effect used on this was recycled from whatever project last used that echo (likely it was guitar playing by Michael Bearpark). Trumpet sounds were played on a soya milk carton prior to recycling, and added to the last section. Tearing off a corner allows the pouring spout to be used as a mouthpiece, as well giving access to the last drops of liquid. These were modified by an old experimental vst pitch shifter which was written as a test for algorithms to be used in software for the hexaphonic guitar. Setting was re-used from the last test that I did. This left me looking for a suitable high pitched melody sound to go over the 3 main sections, perhaps a flute...but no suitable materials were at available. Luckily help was on hand in the form of our friend Volker Grube and his trusty hammer. The old bathroom window needed to be smashed in order to be replaced, so the Zoom H2 was brought out to record the event. Treating the glass sounds in Audition produced several suitable and surprisingly delicate sounds. Tibetan bowl like chimes, a Ting-Cha, and some nicely glass flavoured abstractions. These last sounds are the only ones not to be performed and recorded in real time, with the samples being positioned in Audition in piano roll (pianola) fashion. Pitching on the faux bowls was done by resampling at non-tempered intervals. Sadly, I doubt the glass would have been re-cycled. The piece shows my fascination with field recordings of Asian music. It's remarkable how much of our information still comes to us on dead trees... This piece examines ReUse, the reuse of sound and the sound of paper being prepared for reuse. All sounds are from recordings that would usually be erased - musicians from the band Lewis & Clark performing a sound check and an automated message that was accidentally captured on voicemail. Tearing paper is what you hear when you process newspapers for reuse as confetti or papier rmâché. These recordings were made on Valentine's Day 2009 an reused and assembled during the following week as I am starting to pull out of my winter slump. Although the days get longer they continue to pass. Time is never reused. a set of old guitar strings, sampled and played with pitch, delay & filter treatments. Live recording looping and improvisation by Steve Burnett. 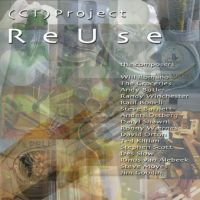 Reuse performed in January 2009 by Steve Burnett. Sound sources of discarded and washed eggshells using contact microphones. No other sound sources used. Wonderful track, Anders! I really like the calmness of it. Several attempts at home made instruments were stymied by my lack of practical skills, so the tried-and-tested standby of hitting things til it sounds ok came into play. Fortunately, we had quite a few bottles left empty after the seasonal festivities... These were combined with sounds from cardboard tubes now denuded of wrapping paper; empty Pringles tins; a reusable plastic tub (confectionary contents long since consumed); bits left over from Christmas crackers (including a comb) and possibly other now forgotten detritus, all recorded on a Zoom H2 mic/recorder, then pieced together in ACID Pro 6 and edited with SoundForge / AudioStudio. So there you have it - "Wintervallic Fabrique". Wooden bits and pieces clamped with a big c-clamp to a wooden stool and plucked with fingers or bowed with a violin bow. The screen shot is of my old DAW software on my Mac iBook showing the last few of the 22 tracks it took to piece together my composition. It really is all pretty basic. I played and recorded only about 5 minutes of sound and clipped and pasted bits together on th Mac to make it into "music". It was not a recorded "performance" per se. It was more just me "capturing" raw material for the project. The music is a "built" piece . . . not a played or performed piece. If there is any single continuous conceptual thread in the piece it was the use of wood . . . the wooden objects we use and throw away carelessly all the time. The are toothpicks, chopsticks, popsicle sticks, hors d'eovres sticks, shishkebab skewers, and (most important) Ace Hardware paint stirring sticks, etc. The track represents sound metaphors of a human body as it experiences a near death experience. This track has been created using a variety of disposable items found in hospital, nitrile gloves, syringes, pill pots, tongue depressors, etc. In case youíre wondering, none of the items had any contact with body fluids, and were thoroughly washed before Re-Use. The opening heartbeat sound was made by using an electrode gel tub played like a bongo, with loads of compression, bass eq and tube amp distortion, with a hint of ambient reverb. The slow down effect at the end of this section was created using the Doppler effect within Goldwave. The 2 ëbreathingí tracks are made by close micing the airflow through syringes (20ml and 50ml) as the plunger is being drawn and withdrawn, one of these tracks recorded after a length of oxygen tuning was attached to the end of the syringe for a slightly deeper sound. Various squeaks and squeals were simply made by inflating a nitrile glove, and pinching the neck as the air is released, just like you might do with a balloon. The other ësqueakyí sounds around the same time in the track were produced by rubbing a glove tightly stretched across the fingers with a wooden tongue depressor. These sounds are mostly reproduced without any effects, although some were articulated at source using my mouth as a formant filter. When the heartbeat stops, further glove squeaks are used to portray alarms sounding. There is also a terrific high pitched drone, obtained by whirling a pair of stitch scissors around on a nitrile-gloved finger (imagine a cowboy twirling his six-shooter) which gives an effect similar to rubbing the finger around the rim of a wine glass. The similar, lower pitched sound was obtained using a different pair of scissors to same effect. The windy whirling sound heard at the same time is simply a piece of oxygen tubing whirled around the head. These whirly sounds were looped in Reaper to create longer patterns. Some low pitched bass sounds were obtained by twanging an electrode wire stretched tight across a resonating electrode gel tub, the small Sony mic placed inside the tub to capture more bass. The rhythmic percussion track (from 2:15) represents the monotonous rhythms of mechanical / electrical life support systems. It was created using (1) a nitrile glove stretched like a drum head over a gel tub and played with a tongue depressor as a drumstick, (2) a second ëdrumí track, pitched higher, (3) the same gel tub played upside down, like a bongo, and (4) a number of tongue depressors held tightly over a table edge and played rather like a thumb piano (this was extremely difficult to do!). These main 4 percussive tracks are looped (using Reaper) to the desired length. In addition, there are a couple of ëshakerí tracks, made by shaking disposable pots filled with a number of small disposable electrodes. I was not entirely happy with the resultant shaker sound, so I tried to tighten it up by eqíing and gating, then added a bit of life by using a rhythmic delay. This was a bit better, though still not ideal, so I kept it quite low in the mix. A few rhythmic syringe pops add a nice rhythmic break. The thumb piano, shaker and percussive hits (tensioning the glove drum head to create a talking drum type effect) also appear sporadically at earlier stages in the track, with various added VST effects. Eventually, (having been re-started) the heartbeat re-appears, eventually syncronising with the rhythm track (symbolising that the heart is now beating normally), which then fades out to leave the heartbeat and breathing sounds. All of the recordings were made using the Boss micro recorder, using either the internal microphone or a little Sony stereo microphone. Each track was subsequently transferred to PC and edited using Goldwave, and the final track was assembled within Reaper. The track ended up completely different to how I imagined it would. It was created using a washing machine drum that I pulled out of a dead washing machine whilst looking to see if there was anything I could salvage to make some noise inside. The wheel at the rear of the drum which connects to the belt has an amazing resonance to it but I couldn't shift it from the drum so I ended up keeping the whole thing. The track was made using two short samples (a few seconds a piece - one being the resonance, the other the pin of the drum, both captured via contact mic) and modifying them in Ableton Live to create a much wider selection of samples. I originally imagined a piece that would be more melodic but as I started to combine the tracks I realised it sounded like a strange imaginery wash cycle and so in homage to its origins I have gone with that flow. All sounds created using and empty glass jar which formerly contained Mrs Brides Mini Mints. Scraping and tapping jar and lid with fingernails, striking lid against jar, plucking gold-coloured elastic tie. All sounds were sampled and played back at original speed and pitch. My track was inspired by two old acoustics that I inherited along the way that were headed for kindling. One came when I worked at MTV a few years ago. Under the desk I was assigned was a generic dreadnought 6 string acoustic that had a broken neck and lots of MTVish stickers on it. The other guitar was a cheap 12-string that I was given many years ago. The strings were very worn as I recall so I took them off and the neck so badly warped that it was like releasing a wild beast never to be controlled again. I always envisioned doing some kind of John Cage 'prepared' guitar with these instruments and dabbled with that a time or two. Spirits began by me accidentally letting one of the guitars hit against the other and it produced this low sort dark sound like something groaning. Both guitars were losely strung with very old strings and no real sense of tuning which became my tuning for my piece actually. I recorded @2 min of the banging against each other into an EHX 2880. I later sat down with the two guitars and a beer bottle, initially to capture video for a promo for this CD planned for a post release idea. My video camera was limited to shooting in 40 sec intervals so I recorded several tracks in Audacity doing random percussive things as well as some fingerpicking that do to the lose strings and no real tuning became more like gamelan textures. Somewhere in that session I started using the beer bottle as a slide. Additionally while improvising with these ideas I began singing sort of a crying cat like voice into the 2880. I had planned to isolate some of the Audacity trax but I began to listen to them all playing together and there was a certain semblance to it and that became the completion of my Spirit of the Wood, Dark Cobbled Streets. I named the piece as the finished sound to my ears was like a carriage going down a dark cobble stone street with like metal hangings clanning as it traveled along. I also envisioned the hull of an old ship in the days when there was captured crew in the hull sentenced to rowing the boat.